Location: At the end of a short access road running south from an unnamed minor road. 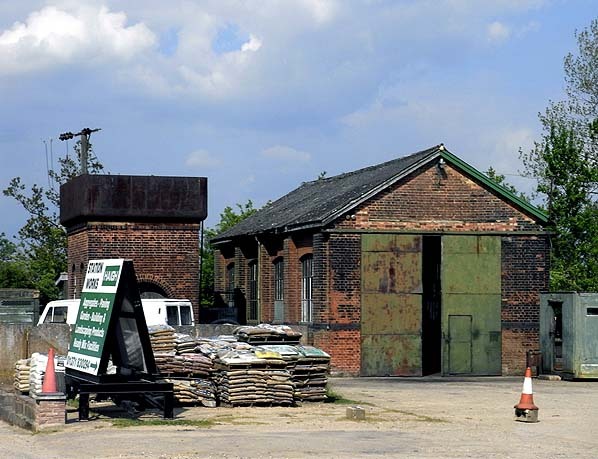 Present state: The main station building, engine shed and water tank all survive within a builders yard. 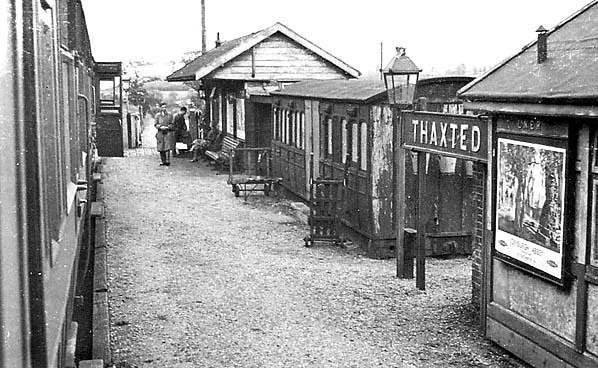 Notes: Thaxted was a small single-platform station with a run-round loop and a corrugated iron engine shed. Passengers alighting at Thaxted then walked across the Chelmer Valley to town; this saved the railway the building cost but crippled its defensive ability when buses lifted passengers from the centre of the town more swiftly and conveniently to nearby shopping centres. 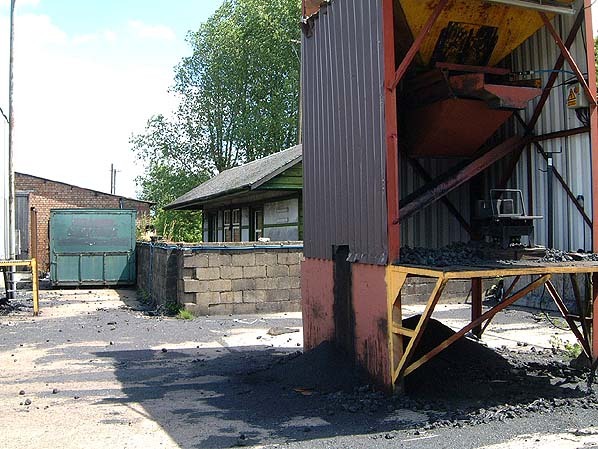 The locally-promoted Elsenham & Thaxted Light Railway was intended to relieve agricultural distress and to be extended to Great Bardfield, over ten miles from Elsenham. 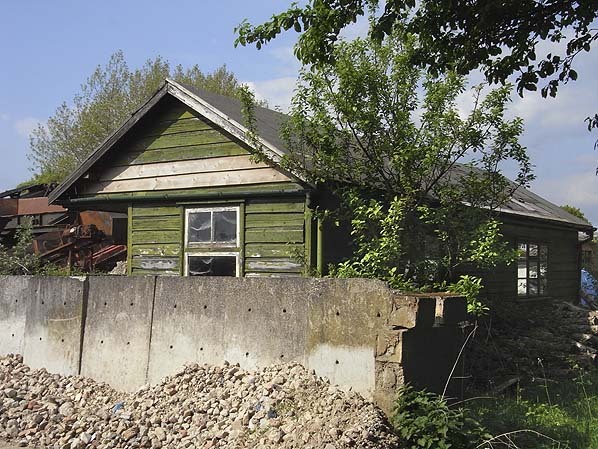 In the event, despite the GER paying half the capital cost and a large grant of £33,000 from the Treasury, little local capital was raised and there was a five-year interlude between the granting of the Light Railway order in 1906 and the start of construction in 1911. The line eventually stopped a mile short of Thaxted church and was opened on 1 April 1913. Typically of light railways of the period the Elsenham & Thaxted was built with few earthworks; steep gradients, only one bridge, and ungated level-crossings with cattle guards wherever possible. At Elsenham there was the connection with the main line and a small goods yard. The passengers were usually few in number. A few trucks generally followed the passenger coaches. The conductor/guard issued thin white paper tickets straight to the passengers like a bus conductor; there were no through bookings. The train slowed down to 10 mph for the ungated crossings picking-up or setting-down at the halts if necessary. There were no signals on the line as only one engine was used on the line at one time. The line was absorbed into the LNER on 1st January 1923. A pleasant line in the middle of Essex it was an early victim of closure as it was slow and poorly connected for passengers and only offered two sidings for goods so that goods services ceased only a year after passenger trains stopped running in 1952. Thaxted Station in June 2003 taken from the same viewpoint as the picture above.